A chain is only as strong as its weakest link, which is why Fleurop spares no effort to make sure its approximately 300 partners in Austria deliver top-quality products. We want you to be satisfied with our services - each and every time. The Fleurop guarantee is simple and straightforward: every order will be carried out with great care, in best quality, and delivered on time. If our service should ever fail to satisfy, please contact us within 5 days of delivery of the flowers and let us know why you were not satisfied. We want every customer to be a satisfied customer. 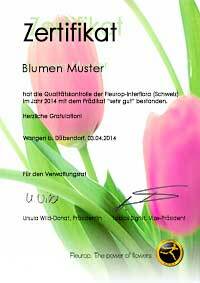 On the subject of quality assurance, did you know that Fleurop conducts regular internal quality checks on the partner florists in Austria? These checks help ensure that the quality of our services remains consistently high - our error rate is below 1%, to no small extent thanks to this measure. Read more about our quality control measures by clicking on the following links. Quality control by Fleurop: so you know you can trust us! Honouring our customers' trust is our ongoing commitment. We therefore periodically check our more than 300 partner shops in Austria for quality, freshness, craftsmanship and customer services by way of test orders. Some 60 partner shops are earmarked for each batch of test orders, the delivery addresses are carefully chosen to make sure they do not set warning bells off at the partner florists. For this purpose, our staff at the Fleurop head office call companies and private individuals at the same locations as the florists and request their collaboration as recipients of a floral test delivery. If they agree, the participating customers receive a written confirmation letter with all the details and, as a little thank you, a 40 euro gift card to be used in any Fleurop partner shop or the Fleurop webshop. Why not 'test' your local Fleurop florist? Click HERE for our shop. The 'mystery customers' do not actually have to do much. 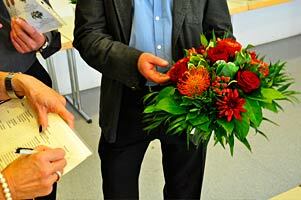 The test bouquet is delivered on the agreed day and collected the following day by one of our drivers. 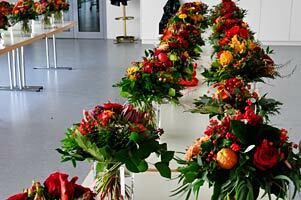 All the test bouquets are then transported to our head offices. 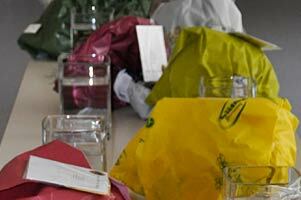 The test customers are not even supposed to unpack the flowers - we want to inspect the packaging, too. All they have to do is place the bouquets in water…and pledge not to disclose their mission as Fleurop test customers to anyone else! As an interesting aside, one of the first questions we ask at the start of the telephone call is, "Does the name Fleurop mean anything to you?" The answer is almost always affirmative. However, on one occasion we called a pharmacy and had a trainee at the other end of the line who seemed to be slightly taken aback by the question: "No, I'm afraid not, is it a medicine? I haven't been working here that long, you know…"
Yes, Fleurop bouquets are the best medicine! Order one HERE. 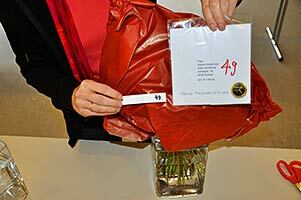 Three or four drivers are tasked with collecting the approximately 60 bouquets from the test customers. This can be quite a tough job. Finding a parking space is often a problem, sometimes a recipient forgets the instructions and unwraps the flowers. And it can happen that a driver arrives to collect the bouquet…only to discover that the test customer has cheerfully presented it to a delighted beneficiary. But all these Fleurop employees are professionals, too, and at the end of the day all the test bouquets - or at least the vast majority of them - are unloaded at the Fleurop headquarters. And of course our drivers apply a 'wet wrap' around the stems to make sure the flowers arrive in best-possible condition. After arriving at the Fleurop head offices, the test bouquets are unwrapped and the inspectors check that the card with the requested text, the sachet of flower preservative and the other required enclosures are all present and correct. The bouquets are now given an identification number and placed in vases, awaiting the scrutiny of an expert panel comprising qualified professionals whose task it is to comprehensively evaluate the floral arrangements. This is done in an absolutely neutral and fair process: the bouquets are identifiable by number only, which means the judges cannot know who they were made by. How about a bouquet that won't be collected? Click HERE for the shop. Does the bouquet value match the order value? Do quality and freshness meet expectations? 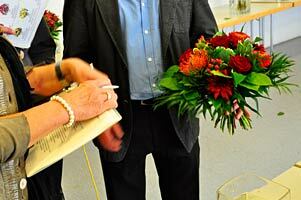 Was the bouquet prepared with due professional skill and competence? Is the bouquet as ordered (character and colours)? Each group fills in an evaluation form for each bouquet, and the results arrived at for each bouquet are compared with the results of the other group for the same bouquet. Then the two groups join forces and, in a third phase, discuss any differences of opinion that may have arisen until agreement is reached. 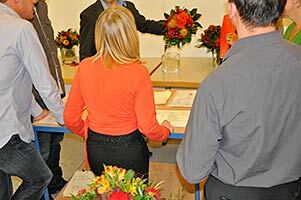 Given the number of bouquets to be examined, it is not surprising that the whole process takes close to a full day. 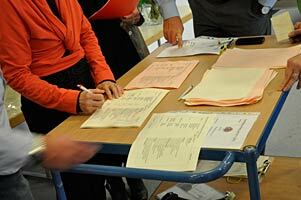 And the assessment criteria are, to all intents and purposes, as strict as those applied by Kassensturz. Why not 'test' your favourite flower shop? Click HERE for the shop. In a final step, the results are summarised and a written assessment of the specific bouquet is forwarded to the florist. It goes almost without saying that strict confidentiality is maintained throughout the process. 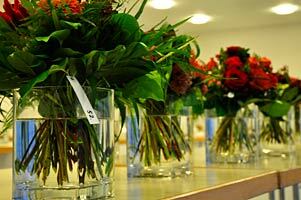 Fleurop conducts these quality checks with the full knowledge and consent of the partner florists. However, they do not know when their bouquets will be put to the test. These internal quality control measures nevertheless also benefit the florists; they help them optimise their own quality assurance arrangements, and they also serve to promote trust between the partner florists - they know that their customers will be served with dependably high-quality products by their colleagues elsewhere. What are the follow-up measures? If a florist's performance is found to be below par, the partner will receive a caution, and in repeat cases will even be barred from receiving Fleurop orders for an entire year. As a rule, though, the results range from 'good' to 'very good'. A top-quality result entitles the florist to a certificate of excellence that is often displayed in a prominent location on the shop's premises. The overriding aim of these measures - an aim shared by Fleurop and all the partner florists - is to make sure we live up to our motto of 'every bouquet a masterpiece'. Make someone's day with a floral masterpiece! Order a Fleurop bouquet HERE. Ultimately, of course, you the customer are the beneficiary of these tests. We give you our guarantee of satisfaction, our promise that we will make sure that every order is carried out with great care, in best quality, and delivered on time. If our service should ever fail to satisfy, please contact us within 5 days of delivery of the flowers and we will do all we can to remedy the situation. Needless to say, our goal is to ensure all our customers are delighted with our services, all the time. And we are working hard to justify the trust our customers place in us. Why not 'test' our guarantee of satisfaction? Order flowers HERE.